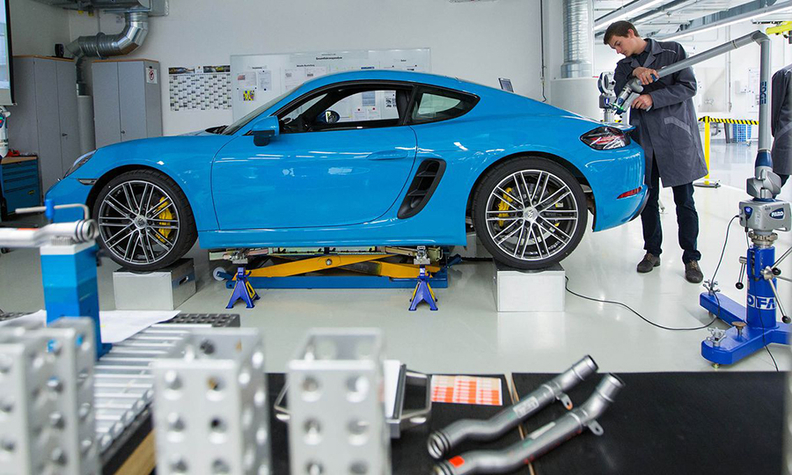 Porsche’s profit machine, already humming, just shifted up. The Volkswagen Group brand delivered 238,000 vehicles last year and posted an operating profit of 3.9 billion euros ($4.1 billion), up 14 percent from 2015. Put those numbers together and it’s on pace to net about $17,250 a vehicle, up 9 percent. In short, every time Porsche sells a 911 sports car or one of its Cayenne crossovers, it could take the profit alone and go buy a brand new Chevy Cruze. Its German peers don’t have nearly as much profit punch. Daimler pocketed about $5,000 a vehicle last year, roughly the same margin BMW has been managing. Part of the money magic is simply price. Porsche doesn’t make cheap cars. Even luxury players like Mercedes occasionally offer more pedestrian versions at narrower margins to get aspiring buyers into the family. And make no mistake, Porsche customers are paying a premium for the brand’s reputation. Ferrari knows this game well. Its operating profit equates to almost $90,000 a vehicle. But about 30 percent of Ferrari’s business comes from engines, key chains, amusement parks, and other things that don’t have wheels. What’s more, the company makes only about 8,000 cars a year, scrimping on supply to keep prices high. Porsche isn’t that precious anymore. In terms of product, by now it’s about one-tenth the size of BMW, and in the past three years has boosted its annual output by 47 percent. That ramp-up comprises the company's new 911 GT3 sports car, which commands $144,000 and up. Plus, the company's profit surge has coincided with the launch of its most affordable model. Hitting dealerships in 2014, the Macan crossover now accounts for roughly 40 percent of Porsche sales. These days “the little tiger,” as they call the Macan around the shop, starts at a prosaic $47,500. But few people who spring for a Porsche settle for basic -- it’d be like going to a steakhouse and skipping the side dishes. The add-on Macan goodies step up as quickly as paddle-shifts on the car’s PDK transmission: big 21-inch wheels ($5,400), natural leather seats in “espresso” ($4,920), seat-warmers front and rear ($1,060), running boards ($1,250), sport tailpipes ($950), whitewashed oak trim ($1,790) and, naturally, a custom paint color ($6,520). “We’re concentrating on delighted customers,” Oliver Blume, chairman of the Porsche executive board, said in a statement. The whole process is customized and emotional, the goal of any luxury brand these days. People don’t just want a fancy scarf or an opulent handbag anymore; they want their fancy scarf, their ostrich-skin purse -- because, well, these days they can get it. TAG Heuer pitches its new smart watch as available in 4,000 configurations. The price range is $1,650 to $17,000. It's do-it-yourself market segmentation. Porsche’s revenue breaks down to almost $99,000 per vehicle. One of the few options that’s still free: factory pickup. If you’re just joining the club, you might want to skip the espresso seats and buy a plane ticket instead.